The Nine of Pentacles tarot card brings a message of abundance, fertility, and joy. Everything you have done and learned is paying off big time. Take a moment to relax and enjoy your wealth. You have created your very own piece of heaven on earth. Like in The Lovers of the Major Arcana, the two trees in the background of the Nine of Pentacles are the trees of knowledge and life. The castle, a symbol of power and security, stands by the Tree of Life. Turning up your nose at the material world is not your style. Life is good, and the best way of thanking the universe for this blessing is to enjoy it to the fullest. The bright yellow sky and ground symbolize intellectual and spiritual understanding: The Nine of Pentacles is a card of wisdom as well as prosperity. The woman standing in front of the rich grapevines is dressed in yellow (wisdom) and red (love and passion). Her garment is embroidered with flowers in the shape of the astrological symbol for Venus. One hand rests on six pentacles, while the other is gloved, holding a hooded falcon. Grapes symbolize fertility, beauty, and joy. Like the falcon in the Nine of Pentacles, they suggest that the best is yet to come. Her free hand is resting on the pentacles, but her eyes are on the falcon. It won’t be much longer until he takes flight. In Egyptian mythology, the falcon represents the god Horus, or Osiris reborn. He symbolizes the promise of new life and victory. His mother is Isis, the goddess in her mother aspect. The falcon is still hooded in the Nine of Pentacles tarot card, meaning that this promise is about to materialize. Astrologically, the Nine of Pentacles corresponds to Venus in Virgo. While this garden may not be secret, it is private. You’re not one to advertise your material or spiritual wealth. To you, heaven is literally a place on earth. No, you’re not obsessed with material success and pleasure. You’ve simply learned how to live life to the fullest. After all, it’s a divine gift, and enjoying it is the best to express your gratitude. You’ve had your share of troubles, but like those barren mountains on the horizon of the Nine of Pentacles tarot card, they have become a distant memory. Bigger and better things are yet to come. Creating abundance and enjoying life are important parts of your spirituality. True, you’ve learned how to turn lemons into lemonade and sour grapes into wine. But asceticism is definitely not your style. 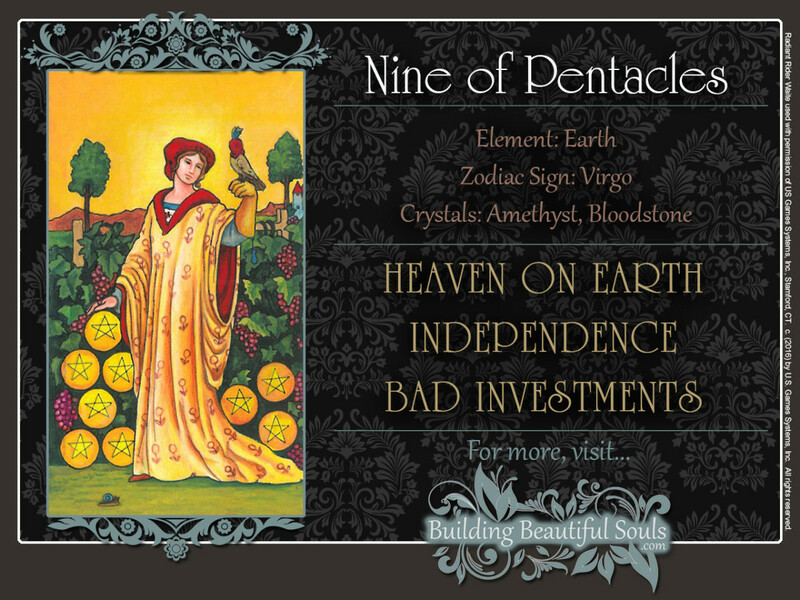 The Nine of Pentacles is more than a money card: It is a card of being and feeling wealthy. This means that instead of letting others define how much money is “a lot,” you are deciding for yourself what’s enough and what’s more than enough. Because you know how to enjoy your wealth, more wealth is coming your way. Besides being a card of wealth and joy, the Nine of Pentacles tarot card also speaks of fertility. All things are now in place, so that a major life goal can be manifested. Whatever it may be, it can happen at any moment. If the Nine of Pentacles card is about an actual pregnancy, chances are you’re reading this article as you wait for your ride to the hospital. Your goal is that close to becoming a reality. In a business situation, that big contract is in mail and all you have to do is sign on the dotted line. It could also mean that an investment you’ve made is about to pay off. It will meet or even exceed your expectations. As far as spiritual matters are concerned, your journey has prepared you for important answers, perhaps even direct communications from higher levels of consciousness. When reversed, the Nine of Pentacles tarot card suggests a premature withdrawal from the material world to pursue higher goals. This is a tricky stage in your development. From this perspective, the pentacles aren’t simply triangular stacks: They’re forming the triads of the Tree of Life. The woman in the Nine of Pentacles is now holding up the astral and intellectual triads in one hand, while her gaze is focused on the supernal triad, the world of pure spirit. Your success may leave you unfulfilled at this point. You feel it’s time for a drastic change. This becomes pretty obvious when you see that some of the Venus symbols on the dress have now become Mars symbols. Be careful not to throw out the baby with the bathwater, though. Your impatience could cost your dearly. Take another look at the pentacles in the reversed Nine of Pentacles tarot card– they are now inverted, suggesting an imbalance of energies. Examine your motivations very carefully. You have worked too hard and come too far to throw it all away. Doing so will leave you vulnerable to people who may try to take advantage of your idealism. They may dazzle you with pie in the sky schemes, but your best interest is the last thing on their mind. That stranger who emailed you will definitely not transfer 20 million dollars to your account. Don’t send him your banking information. The reversed Nine of Pentacles tarot card strongly cautions you to read and reread the fine print in any business situation, no matter how eager you may be to proceed. A little caution now will save you a lot of trouble down the road. If you have suffered a financial or personal loss, this card shows you that taking the time to examine what went wrong may help you repair some of the damage. At the very least, doing so will ensure that you don’t make the same mistake again. A project may take longer to complete than you hoped. Refocus and tap into those hidden reserves. Remember, you’re in this for the long haul. Kabbalistically, nines are associated with the Moon. In the suit of Pentacles, this emphasizes this card’s fertility aspect. Note how the woman’s free hand is resting on the Six of Pentacles, symbolizing the life giving power of the sun, while the Three of Pentacles (the Great Mother) are below the falcon. In traditional Numerology, 9 is attributed to fiery Mars.